Toronto, Ontario, Canada 416 659-9809.
to two little girls, currently living at Peace Matunda in Africa. Gill Cameron volunteered for three months last winter. of two paintings to the girls' high school education fund. party, an opportunity to see the show and talk to the artists. again if you like -- we'll be thrilled to see you. 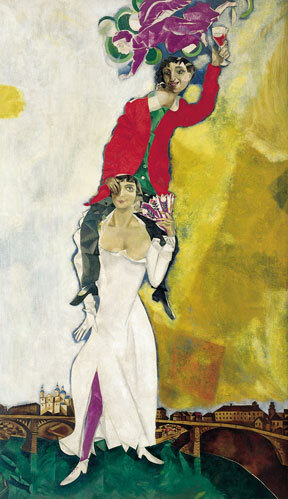 Marc Chagall's work on at the Art Gallery of Ontario. and gets inspired by her travels around the world. travels last winter through Laos, Cambodia, and Vietnam. Her painting is on the left. Zobens I slept like a happy baby. Clearly art is my working life. Labels: Come out to the closing party for Faces and Places. November 24. 2011. Studio Vogue Gallery. Toronto. Ontario. 416-459-9809. Skype art. Canvas.watercolour.Barbara Muir. Gill Cameron. wonderful art. isn't it great when you have a full day of art smorgasborging!! Here's to art...and days off! It was just wonderful. The odd day off here and there is a powerfully good thing. Excellent post, Barbara! I love these images and all that you have going on. It's a worthy cause, and I wish you both, and the charity, a good response. Uncanny about the Chagall. I'm planning on going to the JCC to view the current exhibit: Flight: Mid-Century Artists and the Refugee Experience, in which one of Chagall's work is highlighted. I love this painting, Barbara! Full of all your dazzle and color!